At Spanish Hills Medical Group our goal is to provide QUALITY healthcare to all our patients. From our Doctor's, Nurse Practitioners, Nursing/Medical Support Team to Administrative Support Staff we're here to assist with all your needs. Dr. Alcocer received his medical degree from National University of Tucuman Faculty of Medicine in 1982. He is Board Certified in Internal Medicine and is a Fellow of the American College of Physicians. He is affiliated with St. John's Regional Medical Center and St. John's Pleasant Valley Hospital. Dr. Alcocer’s special interests are in primary care, include managing chronic conditions such as diabetes, heart disease and gastrointestinal disorders. As a primary care physician, he also focuses on patient education and preventive medicine and establishing long-term relationships with his patients. Dr. Alcocer has been in practice for more than 30 years. Outside of medicine he enjoys spending time with his beautiful wife and children and also enjoys the outdoors; hiking, bicycling, boating, canvas painting and sculpture. Dr. Neira has been practicing in Oxnard for the past 39 years. He received his medical degree in 1976 from Universidad Autonoma de Guadalajara. He is affiliated with St. John's Regional Medical Center and St. John's Pleasant Valley Hospital. Dr. Neira is proud to offer high-quality, individualized care. He believes communication and education with his patients is the foundation for effective relationships and is the core in their care and achieving their health care goals. He enjoys spending time with his children, grandchildren, woodworking and glass fusing. Dr. Pleitez is a Board Certified family physician who has been active in primary care for the last 18 years. He obtained his medical degree in 1991 from Escuela Autonoma de Ciencias Medicas de Centro America, San Jose, Costa Rica. He received his post graduate training at Hudson Valley Family Practice Program affiliated with Mount Sinai School of Medicine. Dr. Pleitez is a member of the California Medical Association and the American Academy of Family Physicians. He is affiliated with both St. Johns Regional Medical Center and St. Johns Pleasant Valley Hospital where he served as chairman of the Department of Family Medicine. Dr. Pleitez has also been involved in a quality improvement project for many years and is a firm believer in disease prevention through adequate nutrition, exercise and patient education; all important factors to better your health. He enjoys spending time with his wife, son and is a sports aficionado. He enjoys playing soccer locally and is a member of the first United States Medical Soccer Team (USMST). The USMST represents the United States at the Annual World Medical Football Championships. He also enjoys playing little tunes on the piano and watching his beloved Lakers. Jennifer is a graduate of Loma Linda University where she earned her degree as an Adult Gerontology Nurse Practitioner in 2013. She is Board Certified by the American Nurses Credentialing Center as an Adult/Gerontology Nurse Practitioner. 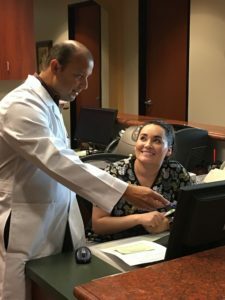 Jennifer works exclusively with Dr. Sergio Neira and together they have developed an exceptional partnership in caring for and treating their patients.